On Saturday morning, the USPKS staff lost the services of two members due to illness. First, Tony Wyse was taken to urgent care complaining of abdomen pain, and was diagnosed with kidney stones. Tony returned Sunday to hang out at the track, relaxing and waiting for the stones to pass. On Saturday afternoon, announcer Randy Kugler was not feeling well, complaining of stomach pain as well. He was taken to the urgent care, and discovered issues with his GI. We wish the best to both on their recovery and look forward to seeing them back to 100% at the series finale. Replacing Randy on the microphone was Tim Koyen, the voice of the Route 66 Sprint Series. I had a great time working with Tim, a character like no other, bringing his personality to the event. We would also like to apologize for the lack of sound in the paddock. The system at the facility is limited and is in need of an upgrade. It is the one thing the GoPro Motorplex is lacking, and we hope that it could be updated before our next trip to the facility. The Yamaha categories provide close racing with the lower horsepower, and the pace depends on the driver and the chassis. The Pro category has been phenomenal all season, highlighted by last lap maneuvers and close racing. 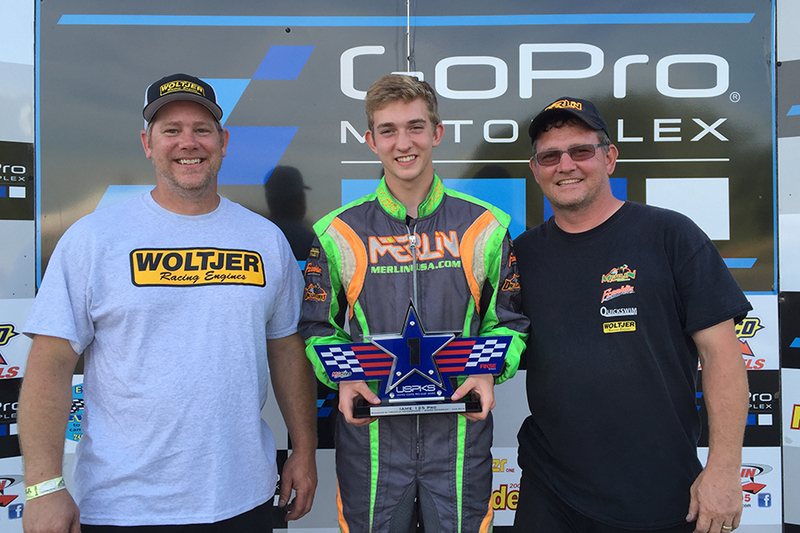 On Saturday, Zach Holden was able to capitalize on the final lap to secure his first victory of the season aboard his Comet Kart Sales / Tony Kart package. On Sunday, the battle came down to a trio of drivers with championship contenders Brandon Lemke (Merlin) and Dakota Pesek (Top Kart) being joined by veteran racer Chuck Tate (Parolin). It came down to the final lap when they jostled for position, coming toward the final corner in a three-wide situation. Tate was in the middle, and they all went for the same piece of real estate at the flat-out right-hand kink. Tate and Lemke ended up colliding and spinning off course. Tate took the brunt of the impact, slamming into the outside barriers. Thankfully, he got right out of the kart and was able to walk away. The actions that occurred immediately after the incident were rather embarrassing, as was quoted by a number of individuals around the paddock. It involved inappropriate hand gestures, bad language spewed at corner workers and threats toward Lemke, including a heated encounter at the Lemke’s pit area. The contact was purely a racing incident, all vying to be the driver to cross the line first. A similar situation occurred earlier in the day in Yamaha Junior with Aidan Harrington – who was stuck in the middle and fell victim to contact. I believe that a person in Tate’s position, among the eldest drivers in the field, racing against kids well under half his age, could have reacted in a better manner. I understand the intensity and adrenaline that shoots through your body after a wreck, but I would like to have seen him show the other racers in his class, and the many kids watching the race and those around the paddock, how to act like a professional with class and respect. Go with your kart to the scale area, have a few ‘choice’ words toward the driver or drivers involved and walk back to your pit. This is not NASCAR, there is no need to start a fight or to go after someone for something that was no one person’s fault. It wasn’t like someone blatantly pushed you into a wall or drove overtop of you by a poor passing attempt. Those who saw that need to understand that is not how to act in that situation, and I hope there is not another moment like that in our future races. Sunday was a day of moments on the track, including a rare one in qualifying. Following the checkered flag in IAME Cadet, Reece Gold was involved in a flip after securing the fast time in the session. Thankfully, he was uninjured in the incident, and ironically, he returned and drove to victory at the end of the day. However, it pointed out a major issue that continues to haunt this category. The kids who are 12-years-of-age and under continue to run 100% full throttle, locked on the rear bumper of the driver in front of them, until reaching the scale line. This really has to stop. It goes along with other columns we at EKN have written with the focus on young drivers ignoring the yellow flags around the course. Parents and tuners need to stop amplifying the need to win and to ‘be the best’ to these kids, which in turn makes or forces them to ignore anything around them. These young drivers really need to show more patience and cautiousness during certain moments, including after the checkered flag. There is no reason drivers can’t step off the gas pedal, coast to a slower pace, and navigate themselves to the scale line in a safe and calm manner. It’s basic racing etiquette that is lacking for several young drivers we see each weekend at the ‘top level’ of the sport. A separate incident on Saturday affected the championship chases in the Cadet class with the exclusion of Kaden Wharff. The end of the Yamaha Cadet Final on Saturday came down to a photo finish for the second position between Wharff and Caleb Bacon. At the line, Bacon edged out the four-time race winner for the position. After they crossed the line, Wharff moved over on Bacon, sending him off the course. This was a second unsportsmanlike conduct incident involving Wharff, following the actions during the New Castle weekend. USPKS officials excluded him for the rest of the weekend. These type of dangerous situations are not what we need in the sport, and it was good to see the USPKS staff act quickly to the situation. Along those same lines, we had two red flag incidents, one Friday and one Saturday. 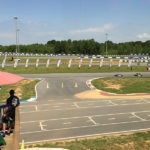 Each time, the parent of those drivers involved ran out onto the track without the permission of USPKS track officials as karts continued to run at full speed. This is another dangerous situation that can be avoided. There is no way to predict what could happen with a random person running out onto the racing area. While I understand the want and need for a parent to get to their child as quickly as possible, we have to remember that karts on the track are not something to take lightly. Parents need to understand the track officials of the USPKS know exactly what they are doing, with over 100 years of experience between the four track officials. They have seen it all and done it all, and know how to keep drivers safe. Their first step is to make sure the drivers involved are not in harms way. Second, they need examine for possible injuries to those drivers. Third, they must ensure that the remaining karts are either stopped or are exiting the track surface so medical vehicles can enter the area if needed. In some situations, the incident may look worse than what it really is, and the officials know when and when not to call a red flag. Parents running onto the track could cause more incidents and do not help the situation. Parents, in the future, should something happen on track to your child, please find an official with a radio near the track entrance or exit, and make sure you have ability to go with them the first chance possible to get to your child. Otherwise, it could be you laying on the ground with injuries or even worse, have another child hurt from hitting you. The top two drivers in the Pro categories continue to be Brandon Lemke and Dakota Pesek. Lemke was a double winner on the weekend in the IAME division to extend his championship lead. The double win was the first of the year, earning the IAME USA bonus purse of $1,500 that was carried over from the first two events. Another $500 will be offered for the finale weekend should a driver double-up in Wampum. With a $1,000 for each win, and third place overall in Yamaha Pro, the Franklin Motorsports / Merlin driver took home a total of $3,750. For Top Kart USA driver Pesek, it was a second straight weekend taking home the $1,000 check for most points on the weekend. Pesek took the victory Sunday and a third-place result Saturday, adding to his point lead as well. It was a near sweep for the Merlin chassis in the Junior divisions on the weekend in Mooresville. After three wins in Shawano, the Merlin chassis notched another three victories this past weekend. Sam Mayer became the ‘Mayor of Mooresville’ on Saturday by winning both the IAME and Yamaha main events. The chance at a possible sweep was broken up by now-Mooresville resident Lance Fenderson, as the VSR / Tony Kart driver laid down a monster final lap to secure his first victory of 2016 in USPKS competition. The Yamaha race was filled with Merlin drivers, and Alex Bertagnoli gained the advantage on the final lap to notch his first in the class on the season. 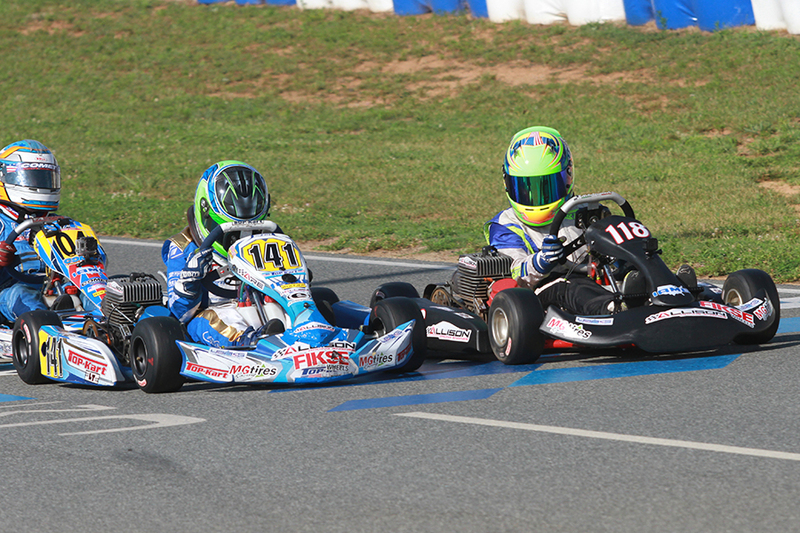 Merlin has won eight of the 12 main events thus far in USPKS Junior competition. Mayer and Bertagnoli sit 1-2 in each of the championships heading to the series finale, looking to add to the chassis success in the series with more wins and more championships. 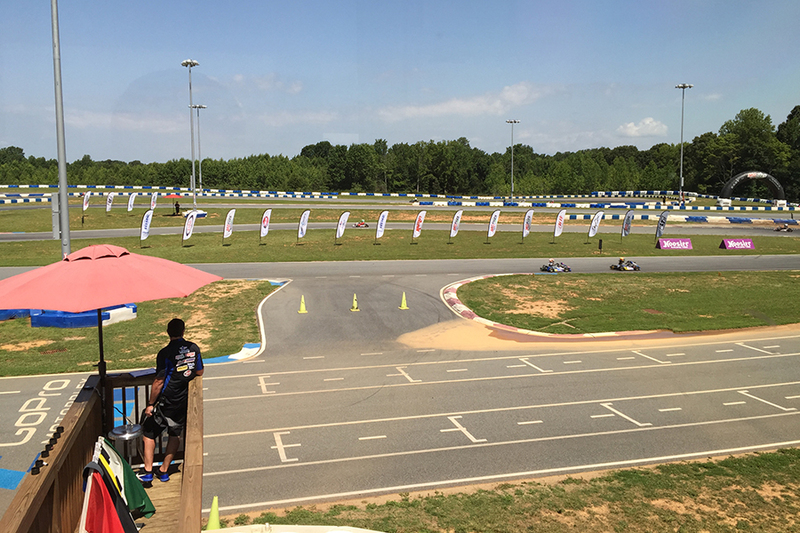 There is a strong contingent of young drivers that call the GoPro Motorplex and the surrounding area home. A number of them were in contention throughout weekend in the Cadet division, taking some wins with them. In particular, the Robusto twins of William and Isabella were impressive. Both are Cadet rookies and made their 2016 USPKS debut at GoPro. William was able to double up on Saturday in both IAME and Yamaha. He ended Reece Gold’s win streak of three in IAME, while the CompKart driver busted up Kaden Wharff’s perfect run in Yamaha. Isabella was just as fast, earning fast time honors in qualifying in IAME and Sunday in Yamaha. 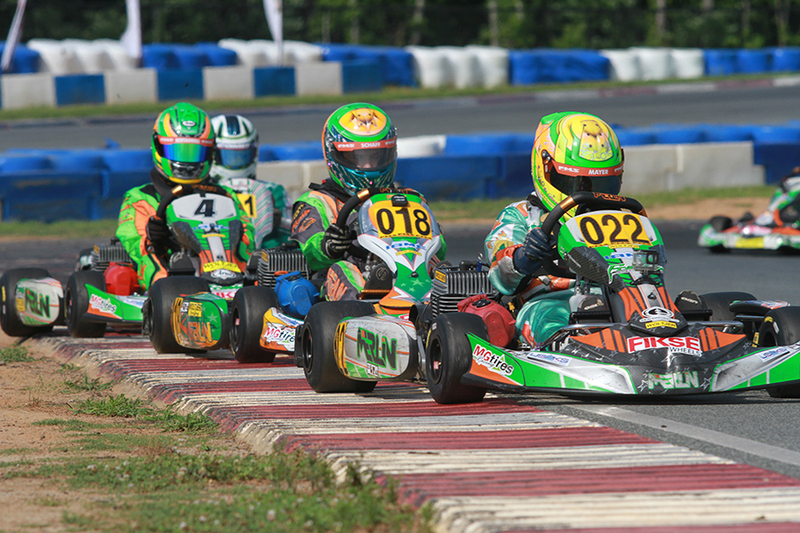 Neither were able to conquer the fields on Sunday in the main events, as Gold proved why he is the championship leader in the IAME Cadet division, holding off Gray Leadbetter. The Top Kart driver recorded her best finish of the season, just missing out on the victory for a runner-up finish. The Sunday Yamaha race was one of the best all season, with the top-10 running together for the entire 15 laps with very clean yet aggressive racing. It was a difficult weekend up to the last lap of the Final for Nicholas Terlecki, with a couple tech issues, a broken bumper in one race, and other things not going on the positive side for the rookie Cadet driver. Among those in the lead group, Terlecki put himself in a position to challenge for the lead in the final lap. 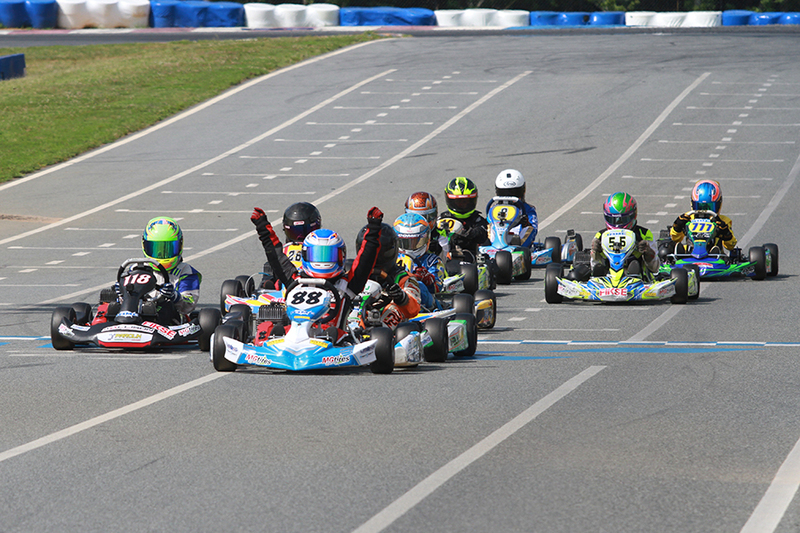 When Caleb Bacon and Kyle Thome went wide, Terlecki was there to steal the lead and the win for his first at USPKS, and the first for the Ricciardo chassis in the series. For Bacon, it was a strong showing on the Parolin chassis, earning two podium finishes for his best weekend of the series. 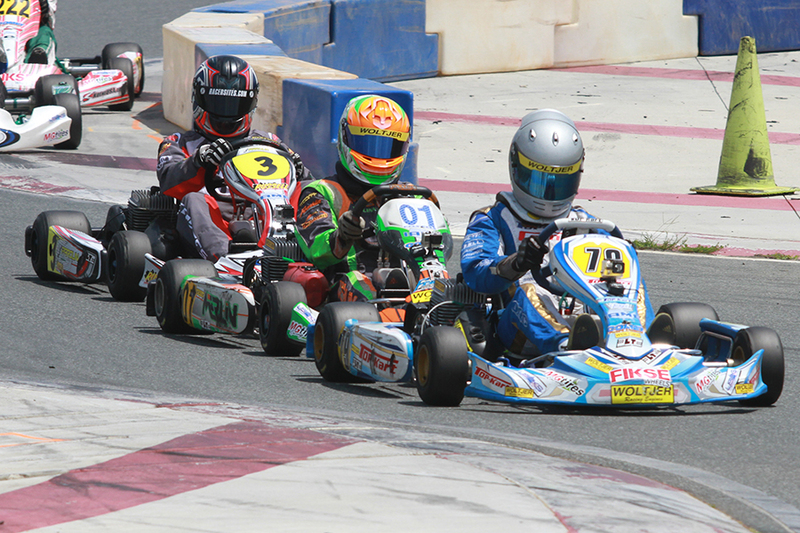 The series now takes a two-month break before the final two rounds of racing will decide the championships in the 2016 United States Pro Kart Series. Round Seven and Eight will be contested at the Pittsburgh International Race Complex in Wampum, Pennsylvania on September 9-11. On Sunday evening, when the final checkered flag has flown, the eight class champions will be crowned at the Champion’s Banquet.